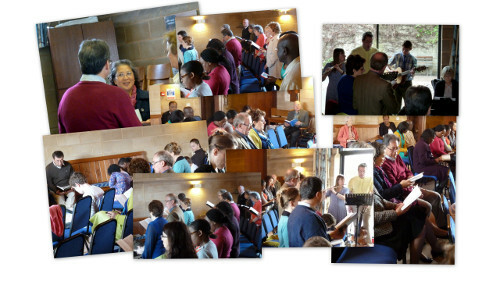 Cheltenham Family Church is made up of people from many different countries and cultures. New friends are always welcome. Essential for growing as a Christian and learning about God’s love. Children are a priority in our church family and we set aside special time for them to learn about Jesus, grow their faith and interact with one another using stories and crafts. A time for all ages to join together singing, praying and listening, in response to a loving God. The church generally remains open after the family worship so that folks can share together less formally or participate in other activities; for example we sometimes enjoy fellowship lunches at the church. Information as to when this takes place will be shown on the Events page. Please note that we do not run a formal afternoon service. Different ages – from 1 to 90. Different interests – from sports to bird watching! – with plenty in between. From all walks of life – kitchen fitters to accountants. Different races – British, Afro-Caribbean, Polish, African, Portuguese and many more. We come together every Sabbath for one common purpose – to worship, sing, pray and spend time together. Outside of church, we enjoy socialising which include day trips, sports, barbecues and picnics, walking and cycling. We hope you feel inspired to visit us and we look forward to welcoming you into our family.